COUNCILLORS ON A Dublin local authority have voted against providing safe walking and cycling routes for schools as part of their development plan. Fine Gael, Fianna Fáil, Labour and Renua councillors on Fingal Council joined forces to narrowly shoot down a motion which would have included, as an objective in the development plan the provision of safe walking and cycling routes for new schools. The 2017-2023 Fingal Development Plan sets out the planning and zoning requirements for the local authority area, which is the fastest-growing in Ireland. Councillors are continuing to hold meetings to decide broader council’s plans for the area for next five years. The motion, a video of which is available here, proposed by the Green Party, was defeated by 19 votes to 16. The Government schools cycling policy commits to providing safe cycling and walking routes to schools. Many schools in Fingal are some distance from the pupils’ main residential areas. The Malahide/Portmarnock Educate Together national school, for example, is in Kinsealy – miles from main population centres like Portmarnock, Malahide or Clongriffin. Green Party councillor David Healy proposed a motion to commit the the council to acquire and develop foot- and cycle-paths between schools and residential areas when acquiring and developing land for new schools. At the meeting, Fingal Council Manager Matthew McAleese said they had a difficulty with the motion, especially as it might lead to compulsory purchase orders (CPO) for the creation of cycling routes for the schools. CPOs involves the acquisition of land for public purpose without requiring the consent of the owners. Mayor Darragh Butler (Fianna Fáil) questioned whether the motion could delay schools “and potentially hold us to hostage in terms of the price we pay”. Healy said the county’s development plan already provides for CPOs and acquisition of sites for schools on behalf of the Department of Education, and the cycling and footpath routes would be an add-on to that process. The motion was proposed after safety concerns from Portmarnock Community Association and other community groups in Lusk and Rush. In September, two young boys were killed while cycling in separate incidents in Louth and Offaly. All told, nine cyclists have lost their lives this year, including two in Dublin. Twenty-one pedestrians have died so far this year, meanwhile, according to the latest Garda statistics. Yesterday, pupils from St Columba’s school on the North Strand in Dublin called on motorists – and cyclists – to obey red lights outside their school. Cllr Natalie Treacy (Sinn Féin) told TheJournal.ie that the motion was a “no-brainer”. “It’s a huge surprise that people could vote against something like this,” David Healy told TheJournal.ie. 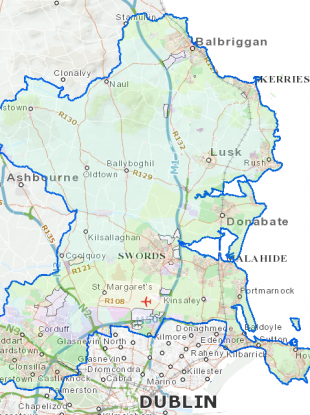 ”Thousands of students will be affected, basically the whole of Fingal. People were saying it would have interfered with commerce, and people’s ability to do business. But it’s not as if you’re shutting down the entire transport network. It’s about safety and encouraging active travel, and sustainable ways for getting around. Public transport links to existing and planned schools aren’t great. The Government’s National Cycle Policy framework states: “We will provide safe cycling routes to all primary and secondary schools and third level colleges by 2020″. In tandem with identifying and procuring new school sites, plan safe walking and cycling routes to school from the residential areas to be served by the school. Where land must be acquired to provide these routes, work with landowners and relevant parties to acquire or arrange for the necessary land. Sixteen councillors from the Green Party, Anti-Austerity Alliance, Sinn Féin, Social Democrats and several independents supported the motion. Four councillors were absent: Barry Martin (Ind); Brian Dennehy (FF); Tony Murphy (Ind) and Edmond Lukusa (SF). Councillor Keith Redmond told TheJournal.ie that he voted against, as it “required of the council to potentially institute compulsory purchases of lands”, and potentially delay new school building. If I voted against Councillor Healy’s motion it would have been to support the management and the professional planners who in my mind would have made a better argument as to what could be realistically delivered. Stretching across north and west county Dublin from Balbriggan, Swords, to Blanchardstown, Castleknock and Santry and Howth head, Fingal has the youngest population in Ireland. It’s also the fastest growing local authority area in Ireland, growing 8% between the 2011 and 2016 censuses censuses. We will provide safe cycling routes to all primary and secondary schools and third level colleges by 2020. An audit will be carried out of every school / routes leading to the school from residential areas. It says the responsibility for this is with local authorities (ie councils) and the Department of Transport. Fingal planning department also opposed 30kh speed limits around cycling routes. That motion for 30kph speed limits near schools was nevertheless passed. Fingal Council management did not comment when asked by TheJournal.ie. Last night, 27 councillors voted in favour of a separate motion tabled by Councillor Healy, providing for specific cycling routes to certain schools across Fingal. The Council opposed last night’s motion. Email “Councillors in Dublin have voted against including safe walking and cycle routes for schools in development plan”. Feedback on “Councillors in Dublin have voted against including safe walking and cycle routes for schools in development plan”.